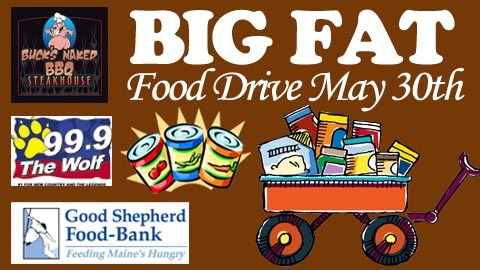 The Portland Sea Dogs in conjunction with the Buck's Naked BBQ and 99.9 The Wolf will hold the "Big Fat Food Drive" on Thursday, May 30th to benefit the Good Shepherd Food Bank. The Sea Dogs will host the New Hampshire Cats at 6:00 PM at Hadlock Field on May 30th. Fans are encouraged to bring non perishable items to the game. Every fan who makes a donation will receive a ticket voucher to use for a future Sea Dogs game for the 2013 season. Buck's Naked BBQ will be at the park, with a table and their mascot, where fans can register throughout the game to win Buck's Naked BBQ Gift Cards. With School Ending the need for food increases as students do not have access to free and reduced breakfasts and lunches. Help the Good Shepherd Food Bank boost their supply for the long summer months, AND enjoy a Sea Dogs game and possibly win some great items from Buck's Naked BBQ!